Many assume that for retirees, purchasing an annuity is a better option than self-annuitization in the decumulation period. In Korea, retirees have shown a strong preference for properties (real estate), and a decision to annuitize has been extremely rare. Using a genetic algorithm, we show that self-annuitization can be recommended as an optimal choice for retirees in Korea if they consider properties as one of the investment options. We set three scenarios that a worker can choose at retirement: self-annuitization, purchasing a whole life annuity, and mixed strategy. We then calculate an optimal asset allocation for each scenario capable of minimizing probability of consumption shortfall (PCS). An important observation is achieved: the optimal asset allocation for minimizing PCS vary by the income quintiles, and PCS rises significantly as the preference for purchasing a whole-life annuity increases. In case of a large reduction in consumption after retirement, however, annuitization may be a better option for retirees in the lowest income quintile. Yaari, M.E., “Uncertain Lifetime, Life Insurance, and the Theory of the Consumer,” Review of Economic Studies, 32. 137-50. 1965. Dushi, I. and Webb, A., “Household Annuitization Decisions: Simulations and Empirical Analysis,” Journal of Pension Economics and Finance, 3(2). 109-43. 2004. Pashchenko, S., “Accounting for Non-Annuitization,” Journal of Public Economics, 98(1). 53-67. 2013. Banerjee and Sudipto, Annuity and Lump-sum Decisions in Defined Benefit Plans: The Role of Plan Rules, Employee Benefit Research Institute, Washington, 2013. Mitchell, O.S., Poterba, J.M., Warshawsky, and M.J., Brown, J.R., “New Evidence on the Money's Worth of Individual Annuities,” American Economic Review, 89(5). 1299-1318. 1999. Rothschild, C. G., “Adverse Selection in Annuity Markets: Evidence from the British Life Annuity Act of 1808,” Journal of Public Economics, 93(5-6). 776-84. 2009. Walliser, J., “Adverse Selection in the Annuities Market and the Impact of Privatizing Social Security,” The Scandinavian Journal of Economics, 102(3). 373-93. 2000. Cappelletti, G., G. Guazzarotti, and P. Tommasino, “What Determines Annuity Demand at Retirement?,” The Geneva Papers on Risk and Insurance-Issues and Practice, 38(4). 777-802. 2013. Friedman BM. and Warshawsky MJ, “The Cost of Annuities: Implications for Saving Behavior and Bequests,” The Quarterly Journal of Economics, 105(1). 135-54. 1990. Bernheim, D.D., “How Strong are Bequest Motives? Evidence Based on Estimates of the Demand for Life Insurance and Annuities,” Journal of Political Economy, 99. 899-927. 1991. Laitner, J. and Juster, F.T., “New Evidence on Altruism: a Study of TIAA-CREF Retirees,” American Economic Review, 86. 893-908. 1996. Lockwood, L., “Bequest Motives and the Annuity Puzzle,” Review of Economic Dynamics, 15(2). 226-43. 2012. Lockwood, L., “Incidental Bequests: Bequest Motives and the Choice to Self-Insure Late-Life Risks.” NEBR Working Papers on Aging and Public Economics. National Bureau of Economic Research, 2017. Turra, C.M. and Mitchell, O.S., The Impact of Health Status and Out-of-Pocket Medical Expenditures on Annuity Valuation, Oxford University Press, New Delhi, 2008. Pang, Gaobo and Mark Warshawsky, “Optimizing the Equity-Bond-Annuity Portfolio in Retirement: The Impact of Uncertain Health Expenses,” Insurance, Mathematics & Economics, 46(1). 198-209. 2010. Peijnenburg, Kim, Theo Nijman and Bas J.M. Werker, “Health Cost Risk: A Potential Solution to the Annuity Puzzle,” The Economic Journal, 127(63). 1598-1625. 2017. Sacks, Daniel W., Health Expenditure Risk and Annuitization: Evidence from Medigap Coverage, Population Aging Research Center, Philadelphia, 2012. Yogo, Motohiro, “Portfolio Choice in Retirement: Health Risk and the Demand for Annuities, Housing and Risky Assets,” Journal of Monetary Economics, 80. 17-34. 2016. Peijnenburg, Kim, Theo Nijman and Bas J.M. Werker, “The Annuity Puzzle Remains a Puzzle,” Journal of Economic Dynamics and Control, 70. 18-35. 2016. Horneff, W., R. Maurer, and M. Stamos, “Life-Cycle Asset Allocation with Annuity Markets,” Journal of Economic Dynamics and Control, 32(11). 3590-3612. 2008. Koijen, R. S. J., Nijman, T. E., and Werker, B. J. M., “Optimal Annuity Risk Management,” Review of Finance, 15(4). 799-833. 2011. Brown, Jeffrey R., “Private Pensions, Mortality Risk, and the Decision to Annuitize,” Journal of Public Economics, 82. 29-62. 2001. Kotlikoff, L.J. and Spivak, A., “The Family as an Incomplete Annuities Market,” Journal of Political Economy, 89. 372-391. 1981. Hurd, M.D., “Savings of the Elderly and Desired Bequests,” American Economic Review, 77(3). 298-312. 1987. Hurd, M.D., “Mortality Risk and Bequests,” Econometrica, 57(4). 779-813. 1989. Hu, Wei-Yin and Jason S. Scott, “Behavioral Obstacles to the Annuity Market,” Financial Analysts Journal, 63(6). 71-82. 2007. 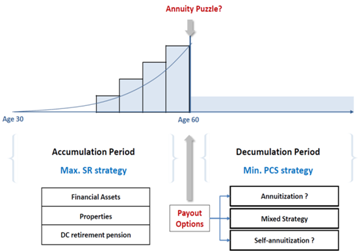 Salisbury, L. C., and Nenkov, G. Y., “Solving the Annuity Puzzle: The Role of Mortality Salience in Retirement Savings Decumulation Decisions,” Journal of Consumer Psychology, 38. 777-802. 2015. OECD Economic Outlook, Organisation for Economic Co-operation and Development (OECD), Paris, 2016. Mi-Ok, Chae and Ha-Seung, Song, The Survey on People’s Awareness of Land, Korea Research Institute for Human Settlements, Sejong, 2007. Albrecht, Peter and Maurer, Raimond, “Self-Annuitization, Ruin Risk in Retirement and Asset Allocation: The Annuity Benchmark,” Journal of Pension Economics and Finance, 1(3). 269-88, 2002. Scrucca, Luca, “GA: A Package for Genetic Algorithms in R,” Journal of Statistical Software, 53(4). 1-37. 2013. Spall, J.C., Introduction to Stochastic Search and Optimization: Estimation, Simulation, and Control, John Wiley & Sons, Hoboken, 2003.